Ekklesía is a print and digital initiative available in various languages, with its most comprehensive version published quarterly in Italian. It conveys and promotes the complementarity of the Church's charismatic and ministerial dimensions in the light of the teachings of the Second Vatican Ecumenical Council. Guided by the principle of universal brotherhood, readers are invited to journey and work together along paths of communion and dialogue. In this way, Ekklesía hopes to contribute to building a synodal reality in which all members of God’s people are valued in the common search for new ways to proclaim the Gospel of Jesus to men and women of our time. Ekklesía’s articles focus on Church and societal renewal; relationships among different Churches and religions; encounters between diverse peoples and cultures; and dialogue with persons of differing convictions or of no particular religious belief. - life experiences, news, book reviews, and reader contributions. Each quarterly issue focuses on a particular and relevant theme. 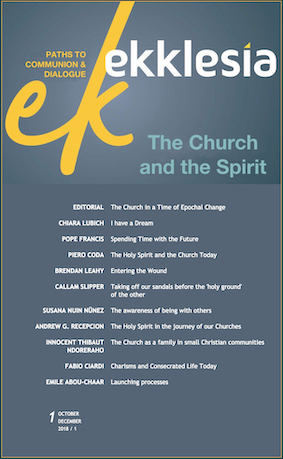 First published in December 2018, Ekklesía reflects the merger of two former publications, “Charisms in Unity” (1990) and “Gen’s”magazine of ecclesial life (1971). People working in all types of pastoral ministry; members of religious congregations and ecclesial communities; persons involved in parish and diocesan activities; leaders and members of movements or associations; those serving on the peripheries or in dialogue initiatives; anyone interested in the journey of the Church in today’s multi-religious, multicultural society. Fabio Ciardi, Piero Coda, Brendan Leahy, Tiziana Longhitano, Jesús Morán, Giuseppe Petrocchi, Susana Nuin, Andrew Recepcion, Gérard Rossé, Callan Slipper, Stefan Tobler, Vincenzo Zani. Hubertus Blaumeiser (editor), Carlos García Andrade, Renzo Beghini, Patrizia Bertoncello, Enrique Cambón, Maria do Sameiro Freitas, Oreste Paliotti. Secretary: Valentina Raparelli & Michele Gatta.